336 in stock Need More ? BBC animated adaptation of the children's book by Julia Donaldson and Axel Scheffler. 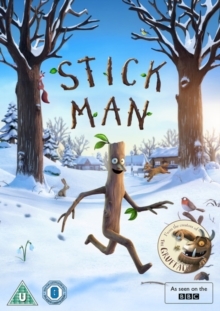 The short film follows the journey of Stick Man (voice of Martin Freeman) as he ventures across the seasons and tries to make it back home before Christmas. On an early morning jog, Stick Man is snatched by a playful dog (Russell Tovey) and taken far away from his house. Will he make it back to Stick Lady Love (Sally Hawkins) and their three children in time for Christmas?